As you may know, I’m on an organization kick lately! 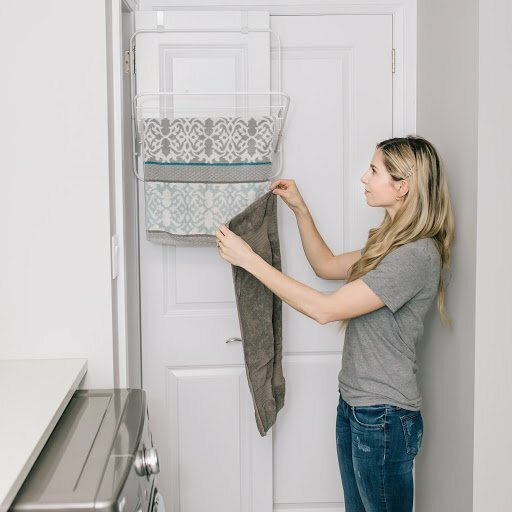 So now, I wanted to share with you all some ideas on how to get your laundry room in better shape. If you’re like me, your laundry room is the LAST place that you can expect to be organized and beautiful. Truthfully, most of the time there are piles of laundry sitting on the counter top and sprawled on the floor. So, I decided to give this room a bit of an overhaul and create a space that’s more functional and inviting. Prior to organizing my laundry room, I didn’t have any shelving in this space whatsoever. We do have a good sized laundry room, and when I found this Bookshelf, I knew it would fit really nicely in this space. 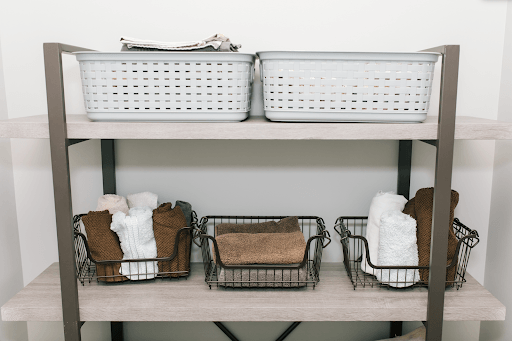 If you’re like me (or pretty much any mom on the planet), you have a ton of towels, rags, face cloths, and blankets that aren’t used often, but still necessary to have. This bookshelf was the perfect place for all of these items, and I ordered these stacking wire baskets to keep the shelf looking tidy and organized. 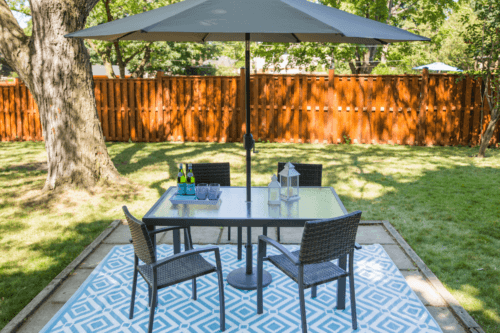 I wanted to keep the colour pallet neutral and light, so I ordered this laundry basket, the matching laundry hamper and these smaller weave baskets which are all sturdy and durable. To save on space, I ordered this over-the-door drying rack which fits perfectly behind my broom closet. When it’s not in use, I fold it back up so that it’s out of the way. But, let’s be honest here…90% of the time it has something hanging on it. Another space saving feature in the laundry room is the over the door shoe organizer. I used the top half of the organizer for seasonal shoes, and the bottom half for extra cleaning supplies. 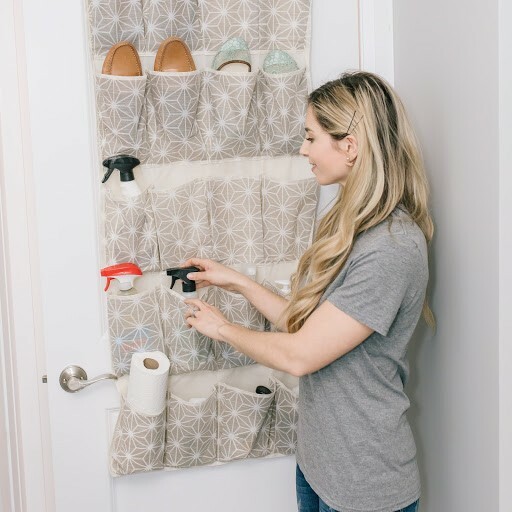 This storage solution is such a great way to save on space and fits perfectly behind my laundry room door! Last, I ordered these gorgeous glass canisters for counter top organization. 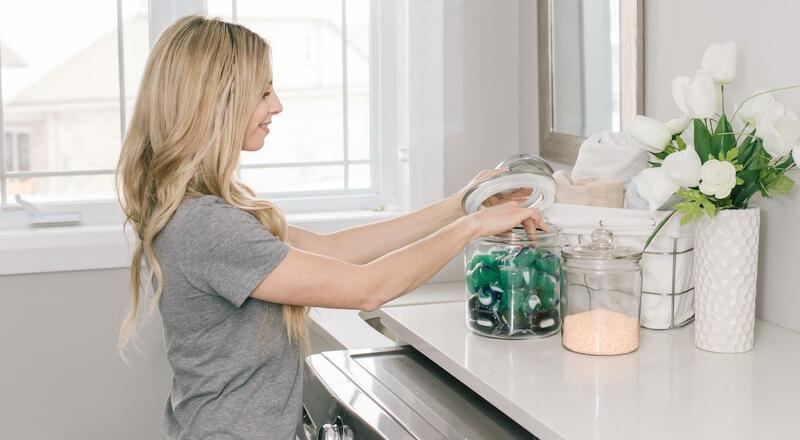 Laundry pods, dyer balls, and washer scents fit perfectly in these jars; and bonus, they look pretty on the counter top! 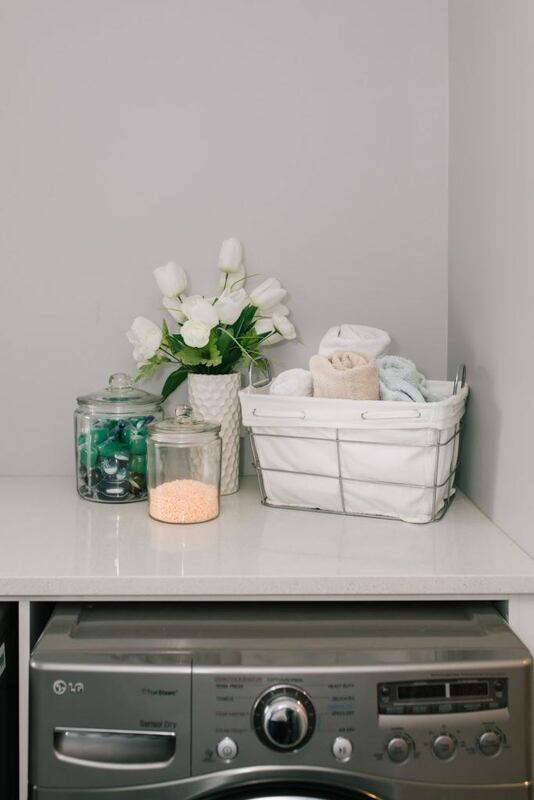 If you do have a counter top space in your laundry room, try accessorizing it with some faux flowers, pretty baskets and canisters to make the room just a bit more inviting and bright! 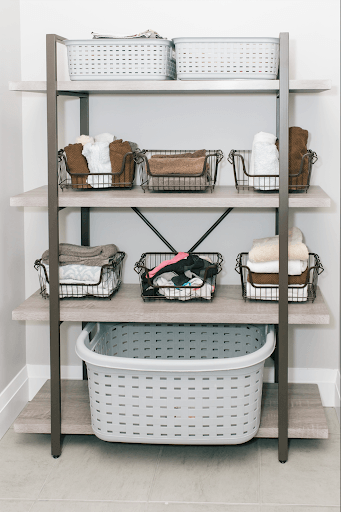 So, there you have it; my laundry room organization tips. Tag us on Instagram at @honestly_alexandra and @kspstuff so we can see your transformations at home, too!